Koh Samui is another of Thailand's big islands and one of our favourites. The island has its own International Airport which which must be one of the most beautiful airports in the world and its also just a 10 minute drive from Chaweng Beach which is the most popular beach in Samui. The real problem is that Bangkok Airways owns the airport and thus there are no low-cost flights to the island. Tip: You can get a minibus taxi inside the airport to any of the beaches on the island. The transfer costs are much cheaper than Phuket. 1. The easiest but most expensive way to get to and from Koh Samui is by direct flight. There are a lot of in and outbound flights daily from Bangkok, Phuket and Krabi with Bangkok Air and Thai Air. Tip: You can go to Bangkok Airways' private lounges and get snacks and drinks for free at any airport if you fly with them. 2. For a cheaper option you can fly to Surat Thani, which is on the mainland, and take a ferry over to Koh Samui. Tip: The budget airlines like Air Asia and Nok Air offer combo tickets where you buy one ticket for the plane, transfer and ferry tickets. It obviously takes a bit longer but can save you quite a lot of money. 3. The cheapest option will be to take the bus to Surat Thani and then take the ferry over from there. The buses that run from Bangkok are quite luxurious and usually it is an overnight bus. Tip: If you take the overnight bus take all the blankets that they offer as the air-conditioning on the buses are freezing. Tip: If you are planning to visit Koh Phangan and Koh Tao then try to structure your itinerary to take the Lomprayah High Speed Ferry that connect the islands with the mainland at Chumporn. They also offer bus and ferry combo tickets to Bangkok. Tip: You can buy food and drinks on the ferries but it will be cheaper to bring your own along. Koh Samui has a lot of different beaches with Chaweng Beach being the most popular and busiest. This is the busiest beach on the island and although it is not as busy Phuket there are still plenty to do and the bars and clubs rock till late at night. The best thing about Chaweng Beach is that unlike Patong Beach most of the accommodation here is lined next to the beach. All the hotels and bungalows have beachfront access and the Main Road runs behind the accommodation, you can just walk out of your room onto the beach with the furthest rooms about 50 to 60 metres from the beach. Tip: Try to get a place with a pool as it is great to go and take a dip in the pool after a day lounging on the beach. The great thing of Chaweng is that there are no high rise buildings on the beach, there is a municipal regulation that states no building may be higher than the Palm trees. Great if you are looking back across the beach. Moving from there you get OP Bungalows' sister establishment which is more centrally located with good budget rooms being P&P Resort. The rooms are quite spacious but very basic although they have a pool which makes up for it. The beach here borders right on the best stretch of beach in Chaweng. Tip: Their restaurant serves a great breakfast and they have some of the best Thai food in Chaweng for very cheap prices. Here you can also get all the daily newspapers to catch up on the stuff you missed whilst lying on the beach. On our last trip in December 2013 we first stayed at Suneast Bungalows before going to Koh Phangan for a few days. Staying at Suneast was fine but one could hear the thumping music from the Ark Bar at times. We needed some peace and quiet and we had a look at Montien House just further up the road. The cheaper rooms were fully booked so we opted for a villa with a private pool, we paid 3000 Baht a night as a walk in rate. The room was very nice but we preferred the resort's own pool as it was right on the beach. Tip: Get the standard rooms, they are perfect and situated right next to the pool and beach. The resort is very popular so try to make a booking before you go. 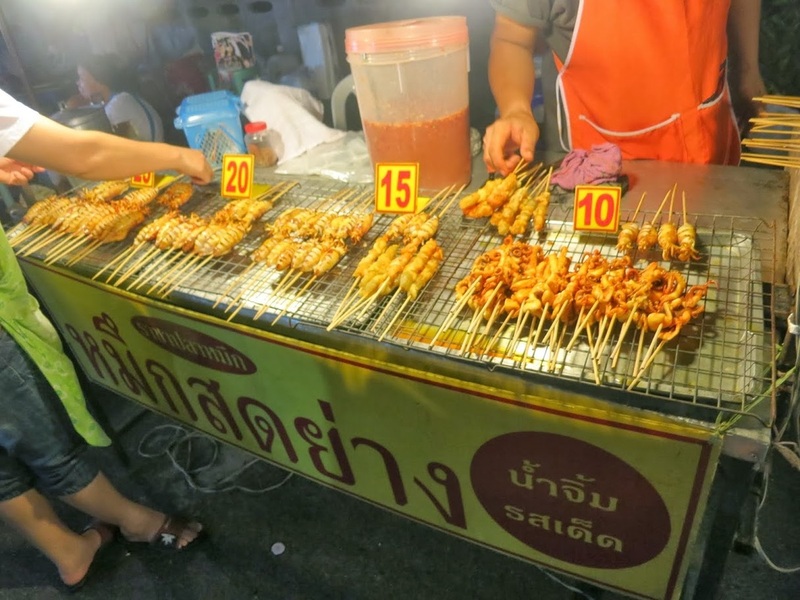 There are plenty of places to eat around Chaweng ranging from cheap local eateries to expensive international diners with the usual splattering of fast food places in between. Tip: If you are lazing on the beach order some food from the ladies on the beach who will prepare a fresh papaya salad with a braaid chicken piece right there. At night most of the hotels set out their own restaurants right on the beach with some offering some live music. Most specialise in fresh seafood which you buy by weight and the chefs will prepare it for you accompanied by a salad bar and baked potato. Tip: If you are craving some home cooked food then you must go to The Islander restaurant which is just past Soi Green Mango on the Main Road. Each day they have a different special which includes a Sunday lunch with Roast, vegetables and all the usual trimmings. They also broadcast all the main sporting events on big screen TV's. The Main nightlife is situated on Soi Green Mango which features pubs, clubs and even some go-go bars. You will find something here for everyone's taste and it is also a place to meet other tourists and travellers. Tip: The biggest beach party is at the Ark Bar Beach Resort and they usually have some type of drink promotion running on Wednesday and weekend nights. Tip: If you have the time then go to one of the 99Bht eat as much as you like BBQ's outside of Chaweng. There is one on the road that runs from Chaweng to Lamai. You cook your own meals at your table on a braai that is placed in the middle, great fun. Lamai Beach which is just south from Chaweng and just a short drive away is much quieter than Chaweng, but it still has its own beautiful stretch of beach with lovely restaurants and hotels lining the beach. We have only stayed at the Lamai Inn 99 (http://www.lamaiinn.com/db-v2/main.php) and the beachfront bungalows are a steal even in high season as it has direct access to the beach with spectacular views of the sunrise. If you want to explore the island yourself then the best is to rent a car for the day, get a map at one of the local travel kiosks and start at one point and circumnavigate the island. This can easily been done within one day with a few stopovers to do some sightseeing and grab something to eat. Tip: The rental period is 24 hours so the best is to rent a car at 5PM and return it the next day at 5PM as this way you can have the car the first night to go to Sunset Viewpoint to have a drink to watch the sunset over Big Buddha. Above is a small Suzuki Jeep that you can hire if you are two but there are also bigger sedans available if you are more . If you want to do an organised trip then your best bet is to go on a one day safari tour which will include a few stopovers all around the island including a stop over at the famous grandfather and grandmother rocks, a few temples, going to the highest viewpoint on Koh Samui, going to watch elephant and crocodile shows, having a ride on an elephant, visiting Big Buddha and a big buffet lunch. All this is done on the back of old army jeeps and this is the best way to see the whole island if you have limited time. The price of this tour will be between 1000 and 1400 Baht inclusive of lunch and all excursions. Above the crocodile show which features some crazy people. There are numerous other day trips that you can book at any of the travel kiosks including cookery courses, tree zip sliding and snorkeling trips. Tip: If you don't have time to visit Koh Phangan then you can easily take the morning ferry across to Haad Rin spend the day there and take the afternoon ferry back. 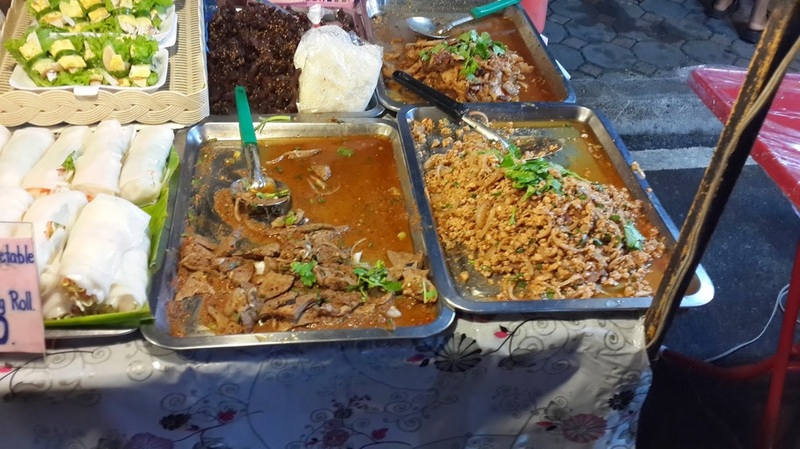 There is also a great Sunday Night Market in Lamai that makes an amazing night out from the hustle and bustle of Chaweng. There are a lot of food and drink stalls. Tip: Go hungry as the food is great and cheap. The home of the world famous Full Moon Party where thousands of party goers descend on the island for a huge party on the beach under the full moon. The beach where it is held is Haad Rin and one can take a ferry direct from Samui to the nearby pier. 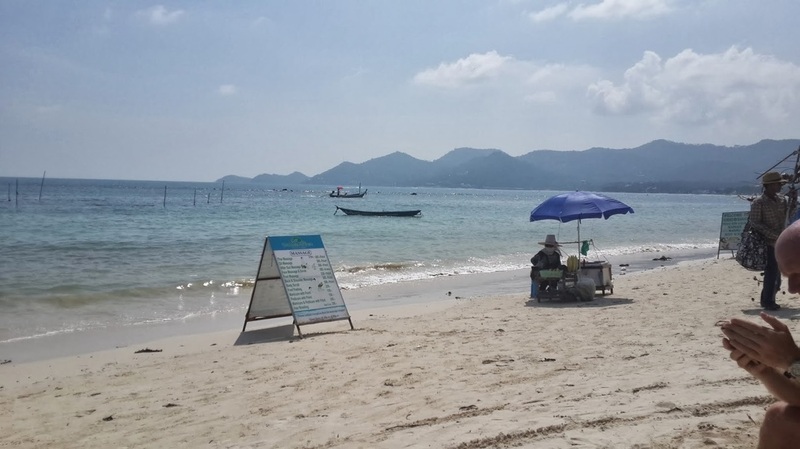 We have not been to Koh Phangan since 2000 although we have taken a day trip over since but we can't really give an informed view of the island as it has changed a lot since then. Hopefully we can visit soon to give a full trip report. The smallest of the three islands lies just North of Samui but it is also one of the best in Thailand. The ferry runs from Samui and stops at Koh Phangan before it sets off to Koh Tao. Tip: Take the Lomprayah Seatran High Speed Ferry for a quick transfer there that takes about two hours. Approaching Koh Tao you will immediately be awestruck by the beauty of the little beaches and coves all along the coastline as you approach the pier. The most popular beach on Koh Tao is Sairee Beach, it is to the left of the pier as you approach land. Tip: If you are going to Sairee get a Songthaew taxi to drop you off in the Main Road of Sairee Beach so that you can start looking for a place to stay. Most of the bungalow establishments sit along the narrow path that runs from the Main Road back up the hill to the pier's side. Tip: If you are going to scuba then try to get a place that has a diving school as they will offer discounts on the accommodation. We had a walk along the pathway and visited a few places but decided to stay at Sairee Beach Cottages right on the beach as it is very close to the centre of Sairee's shops and pubs. We got a bungalow right on the beach for 2000 Baht a night including an air-con, the rooms are the same but the with air-con they give you the remore control to switch on the air-con. Tip: We decided to give back the air-con remote from the second night as air-con is not needed because of the nightly sea breezes, the rooms are also 500Baht cheaper. We took the rooms on the left hand side that are marked in purple on their website. Tip: The room right next to the restaurant has a little shop right behind it that is convenient to get ice and cold drinks for your sundowner. The view from the rooms are spectacular and you will have one of the best sunsets in Thailand right on your doorstep.Tip: Get some snacks at the roadside right in front of the 7-eleven along the Main Road to accompany your sundowners. Koh Tao is the diving mecca of Thailand and once you get to the island you will be spoiled by the myriad of choices to go and explore the coral reefs surrounding the island. If you just want to snorkel then get a daytrip that takes you right around the island with several stops at beaches and a nice Thai lunch on the boat for 650 Baht per person. Tip: Buy a waterproof bag for your camera at one of the diving shops to take great photos of the fishes. You will visit several beaches along the coastline including a nearby island, Koh Nangyuan. Another alternative is to rent a longtail boat for the day that will take you many other secluded beaches not visited by the above daytrip. Tip: The longtail boat operators are lined along the beach and you must bargain regarding pirces. We got our rental for 1500 Baht for the day, you pay per boat and not per person, so if you are four people it will cost less per head. Take your own drinks and food as there are not many shops along the way. Once you are finished in Koh Tao you can head straight on to Chumphon and take the bus to Bangkok or go back to Koh Samui and take a plane to Bangkok. Tip: You can also take a direct flight from Koh Samui to Pattaya if you first want to visit there or explore the East Coast with Pattaya as a starting point for Koh Chang and Koh Samet as both are easily reachable from here.